Robert Woodhead Limited together with Nottingham City Homes welcomed 17 construction students from local schools and colleges to a new build development in Nottingham earlier this month. The development is part of a programme of 26 new Code for Sustainable Homes Level 4 properties for Nottingham City Homes in partnership with Nottingham City Council that are currently being built by local contractor Robert Woodhead Limited. Five BTec Construction Students from Big Wood School and twelve NVQ Students from Vision West Nottinghamshire College attended. The students got an insight into a live and operational site and also had the chance to talk to professionals in the construction industry. Richard Whittaker of Nottingham City Homes talked to the students about differing career paths in the construction industry, including Project Management, Quantity Surveying and Marketing Roles. Sam Webster of Nottingham and Nottinghamshire Futures gave a seminar on apprenticeships and discussed work experience opportunities with the students. It is hoped that the students who attended today will be able to use the experience to help find apprenticeships and work experience in the industry. The students found the day extremely valuable; they were inspired by the speakers and seeing a busy site. A number of the students have already expressed an interest in work experience opportunities within the industry. Robert Woodhead Limited is committed to training and development and has recently have supported 4 students between the ages of 14-16 in the Young Apprenticeship in Construction Scheme in partnership with Education Business Futures. They have completed over 150 days of training and development with the apprentices who benefited from guidance and tuition by our pool of experienced Site Managers. During their time with Robert Woodhead the apprentices gained and developed a wide range of craft, technical and “employability” skills. Big Wood School have been engaged in a series of site visits with Contractors Robert Woodhead and also visited Wending Gardens which is part of the wider development of 26 homes in April 2013. It is intended that the students will have the opportunity to return later on in the project to see progress. 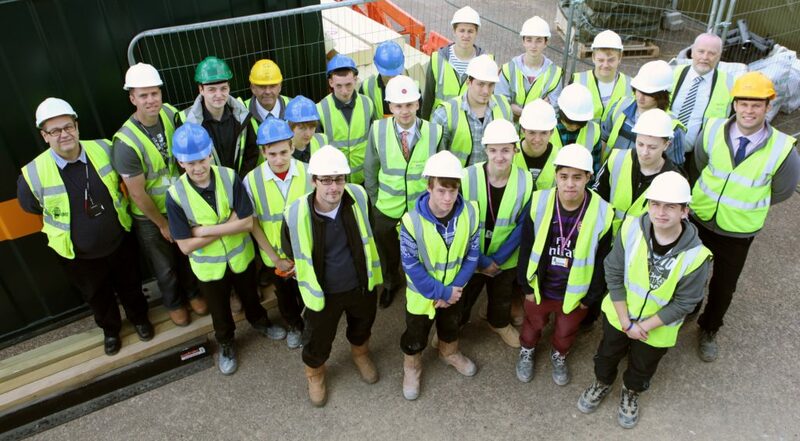 Vision west Nottinghamshire College were invited to site by John Jackson of Nottingham City Homes.